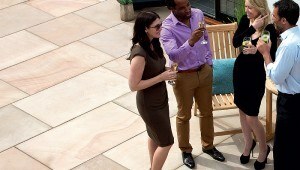 Indian sandstone has always been a firm favourite with British homeowners. With its attractive appearance and functional characteristics, people are choosing Indian sandstone as their preferred choice for their garden area more often than ever. How can you be sure you are buying quality paving? Indian sandstone has always been a firm favourite with British homeowners. With its attractive appearance and functional characteristics, people are choosing Indian sandstone as their preferred choice for their garden area more often than ever. Leading stone manufacturers, Marshalls, have created a ‘Stone standard’, in which they set a minimum criteria for all of their stones, which not only meets British Standards but exceeds them. What is the Marshalls Stone Standard and how does it relate to your paving? Water Absorption – Your brand new patio could look like the picture below in just a few months; covered in algae and degrading rapidly. To ensure this doesn’t happen, make sure that you choose a stone with a water absorption rate no higher than 1.7%. The higher the percentage, the higher the chance your paving will go green. Marshalls have a maximum absorption rate of 1.7%. Surface and Bed delamination – If you choose a softer sandstone, they will have a poor compaction between the sedimentary layers which could lead to your paving splitting and cracking. What’s more, if moisture gets in-between the gaps of your stone, ice crystals can form and the surface of your stone could potentially come away in sheets. To prevent this happening, make sure you opt for a stone with a flexural strength of no less than 12.9mpa. Before agreeing to any products, ask your chosen landscaper if the products will meet the figures the stone standard sets out…if they don’t meet them, consider changing your product! After all, if you’re spending money, you’ll want to make sure the investment is totally worth it! Here are a few of our Marshalls favourites! Fairstone Riven Harena – The natural texture of this superior split stone and our carefully graded colours reward you with an enduringly attractive patio. You have 3 beautiful subtle blends to choose from; Autumn Bronze, Silver Birch and Golden Sand. Fairstone Flamed Narias – This paving has a softly texture d stone surface in stylish coursed patterns, adding elegance to your garden. 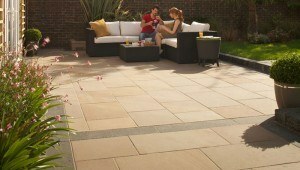 Available in two colours, they will give an attractive natural blend across your patio. Fairstone Sawn Versuro King Size – This exciting larger size paving is ideal for creating the ultimate high end and contemporary finish. Adding this paving to your garden design can make a real statement. 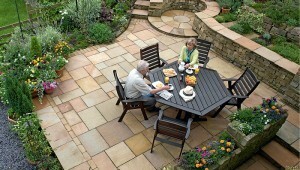 Click here to view Marshalls full range of paving products.